It was a short article in the paper on page eight. “Texas Board of Education Targets Islam in Textbooks.” The gist of the article was that the social conservatives on the board were not going to stand by and let what they perceived as anti-Christian bias make its way into their social studies textbooks and passed a resolution to that effect. They demanded that more coverage be given to Christianity and faiths other than the Muslim faith. I hope that means they will devote a good chunk of coverage to the Crusades, but I’m not holding my breath. Ray Bradbury’s novel Fahrenheit 451 seems more and more prophetic, every time I read it. A line from the novel comes to mind after reading that article this morning: “Oh, God, the terrible tyranny of the majority. We all have our harps to play. And it’s up to you now to know with which ear you’ll listen.” But how do we know? Where does the truth lie? With so many groups having their own agendas and biases, whom do we believe? Our quality of information is so diminished that we don’t know which way to turn anymore. At least that is true if we are truly seeking truth. Growing up, I used to think that if you heard something on the news, then you could believe it. Weren’t we all that naive once? But we can never get all of the story. Everything we read has been filtered through someone’s bias, and there is less objectivity than ever. Just deciding what to report on often involves decisions based on what will sell, with what is the most titillating pushing out what might be more newsworthy but boring. 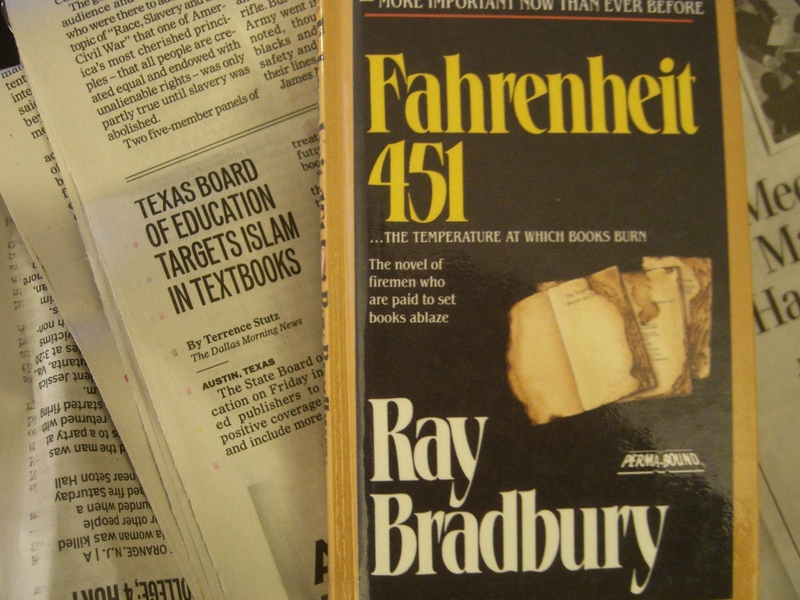 This entry was posted in Favorite posts, Just Blogging and tagged Christianity, Fahrenheit 451, Islam, life, Muslim, newspapers, Ray Bradbury, Religion and Spirituality. Bookmark the permalink. Isn’t it funny how some Christians don’t see the act of removing or barring a Muslim understanding as being an anti-religious bias as well? Why can’t some people see that it feels the same to a Muslim to be maligned or marginalized as it feels to a Christian? It saddens me that some people’s faith is so threatened by the faith of others. Well said, Single Cell! I am embarrassed when my fellow Christians show themselves to be bullies. Their God is too small, as J.B. Phillips once said. I think in part we believed what we read because there was less bias ,,, there was news and there was opinion … on the opinion page. We need to be open minded but it also scares me when someone says something like “what about 911 and the very real possibility that Muslims were scapegoated for this evil act.” We can’t be so open minded that our brains fall out. Yes, I think there used to be a greater distinction between what was factually reported and what was spin. It’s so hard to tell now. We just have to use our brains, as you say. I love the sarcasm about the Crusades!! As a Christian, I am always reminded of how we have failed as a religious group. In the future, I hope and pray we act in a way that would please our Father. Absolutely! It’s like we want to push under the rug every rotten thing we’ve done in the name of the Father. Thanks, J to E.
Very well said, Susan!! Kudos and this blog really should have gotten more attention. Glad you took the time to read it and leave a comment. This is an important post. I admire your boldness in writing what is so true. We were naive back then believing our favorite writers, reporters and anchors. We are so much more discerning now. A few weeks ago I wrote “Uncle Jack” and actually suffered angst about pushing “Publish”. 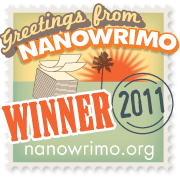 A blogging friend from CA and a lawyer, read it and encouraged me to PUBLISH. At 61, I grew during the life of that post. I like your reader’s comment also. Thank you, Georgette. I’m going to check out “Uncle Jack” now. Several times a week, I can count on receiving an anti-Islamic email. And many of them are upsetting. Yes, it seems that some sects of Islam are brutal in their treatment of women and prisoners. We have all heard the stories. But what about 911 and the very real possibility that Muslims were scapegoated for this evil act? Look what we have done to the people of Iraq and Afghanistan. As I recently told one person, “I can’t figure out who are the good guys and who are the bad guys.” The quality of our news is indeed diminished. “Mirror, mirror, on the wall, who is the most corrupt of all?” My mental filter apparatus is still working–at least somewhat–but it must work overtime to separate the wheat from the chaff. And it’s a hard job. And there are so many out there that don’t make the effort. They believe what they want to believe instead of searching for the truth, or at least being skeptical.